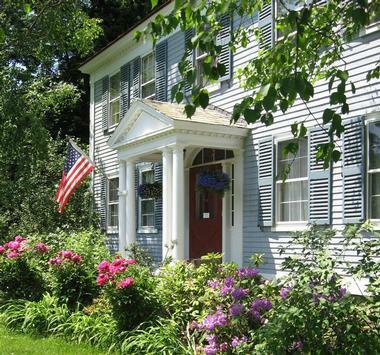 Whether you are looking for a historical inn, country estate or a cozy bed & breakfast, there are many beautiful romantic places to stay in Massachusetts. 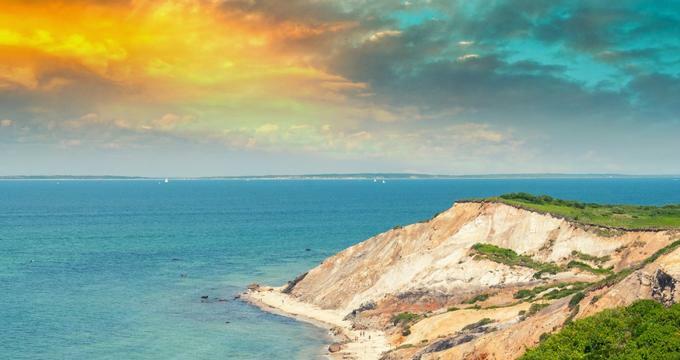 Check into a romantic inn in Cape Cod, MA, plan a relaxing weekend in Lenox, or go on an island escape on Martha’s Vineyard. The Inn at Scituate Harbor gives guests views of the harbor along with spacious guest rooms and an amazing sunrise. The newly renovated guest rooms all have harbor views along with deluxe amenities and queen and single beds, two doubles, queen, or king beds. Enjoy an in-room refrigerator, iron with ironing board, hair dryer, iPod docking station, and complimentary daily bottled water. There are also free calls within the US and wireless internet access. Guests can also opt for a suite with a living and dining area and two queen beds. 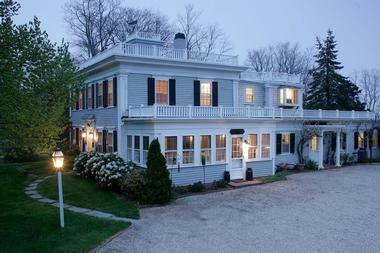 The Honeysuckle Hill Inn is a bed and breakfast with old-fashioned hospitality in an 1810 farmhouse. All guest rooms have private baths and marble showers, flat screen TVs with cable, air conditioning, hair dryers, clock radios, ceiling fans, and wireless internet access. Relax in the library or use the guest computer or a parlor game. Guests can also borrow beach towels, umbrellas, and beach chairs, enjoy the wrap around front porch or the fireplace, or stroll through the gardens. There is even an outdoor shower and hot tub. Guests are treated to a hot gourmet breakfast in the dining room. It includes fresh brewed tea and coffee, homemade baked goods, fresh fruit or fruit yogurt, and a hot entrée like baked apple pancakes plus Irish bangers, baked eggs with Brie and vegetables, Ricotta cheese pancakes, or a breakfast pizza. You can also have fresh tea or coffee before breakfast or enjoy complimentary sodas and spring water at any time. 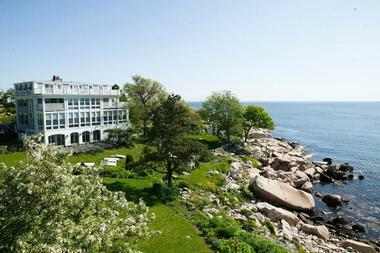 Right in the center of Marblehead’s harbor district, the Harbor Light Inn gives guests quick access to nearby accommodations. There are twenty rooms, many of which have fireplaces or are larger in size. Each room has a private bath, air conditioning, iron with ironing board, hair dryer, phone, TV and DVD player, Wi-Fi, alarm clock radio, and body care products. Some also have sundecks, patios, or remote stereo/CD players. There are also one and two-bedroom apartments available, some of which have fireplaces and/or Jacuzzis, and they are perfect for long-term stays. Guests can arrange for a single or couple’s massage or have flowers or wine delivered to their rooms. The inn has a DVD library and a seasonal heated pool. Spend some time in the Tavern with cordials, beer, and fine wine along with local favorites such as grilled paninis, crab cakes, shrimp, and chowder. The daily breakfast is an extensive continental buffet with juice, fresh coffee, tea, seasonal fruit, cakes, yogurts, fresh baked bread, hot casseroles, quiches, and an available gluten-free menu. You can even take a tray to your room or outside. Cider, iced, tea, or lemonade and cookies are served in the afternoon. Guests also have access to sodas, bottled water, and snacks during the day. This coastal bed and breakfast is in a seaside town perfect for a walk along the beach or easy access to the famous Cape Cod Rail Trail for a walk or bike ride. The boutique inn has nine guest rooms to choose from, each with luxury amenities, modern baths, and artisan bath amenities. Rooms have artisan soap, homemade lavender spritzers, Turkish towels, comfy robes, and triple sheets. This inn has spacious gardens and a pool that is open in the summer. The views are breathtaking, and you can easily walk to numerous attractions and conservation land. There are spa services in a designated room, and you can schedule an appointment ahead of time for a full body massage, couples spa, facial, or other treatment. The daily farm-to-table three-course breakfast consistently gets great reviews and is perfect for alfresco dining. The breakfast features fresh herbs, vegetables, and fruits from the inn’s garden along with delicious baked goods. This luxurious bed and breakfast has 15 rooms divided between the traditional country home Main House and Cottage. Each guest room has a private bath, air conditioning, L’Occitane products, spa robes, hair dryers, DVD players and LCD TVs, access to the guest DVD library, and complimentary Wi-Fi. You can also choose a room with a sofa or club chair, working fireplace, king sized bed, private porch or deck, Keurig coffeemaker, and/or jetted tub. There are also a few suites with even more amenities and space. There are five acres worth of gardens and grounds to explore. The heated pool is 70 feet, and there is an onsite Lenox Petit Spa with dedicated rooms, facial treatments, and massages. Inside, you can relax in the library or sherry room. The food is always fresh and made to order, including the full breakfast that comes with every stay and a cold buffet. Guests can also choose to have a private meal by the fireplace or dine al fresco. There is a well-stocked guest pantry with afternoon sherry, other beverages, and complimentary snacks. The owners of the inn also own Apple Orchard and Farm Winery, which is a popular destination for guests. 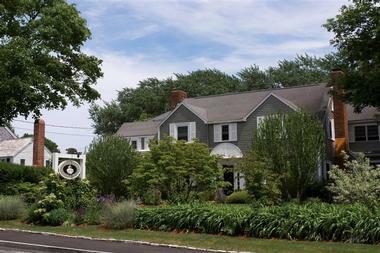 This is among the best bed and breakfasts in Cape Cod and features 16 guest rooms and suites. The rooms are divided between the 1839 mansion in the Greek Revival style known as the Main House, the Cottage House, the converted stables, and the Captain’s Cottage, which is 200 years old. Every room has a TV with DVD player, iPod docking station, fireplace, private bathroom, air conditioning, and complimentary Wi-Fi. Some rooms also have whirlpool Jacuzzi tubs for the utmost in relaxation. Guests are free to stroll through the two landscaped acres of property with English gardens. You can also access the fitness center or enjoy the seasonal outdoor pool. There is a full daily gourmet breakfast. Every afternoon, guests can enjoy the afternoon cream tea. In the evening, there is a complimentary snack with hot beverages in the kitchen plus complimentary sherry and port in the library. Upon arrival, guests receive a welcome basket with bottled water and snacks. Guests can also opt to buy a fireside or poolside lunch. The Marblehead Inn is a boutique inn with exquisite rooms and common spaces in a building that was a private residence built in 1872. It has been a guesthouse since 1923 and features 11 comfortable rooms with rich decorations. Each of the six rooms and five suites have been recently renovated and feature modern amenities like Sony flat-screen TVs with HBO and cable, iHome docking stations, Le Natural Earth Friendly shampoo and soap, free wireless internet, and updated private bathrooms. Suites all have wet bars featuring Keurig coffee makers, sinks, and refrigerators. During free time, guests can relax on the breakfast deck or in the airy dining room, the vintage lounge, the landscaped garden, or the sitting area. There is even an outdoor fountain feature. The day begins with an extensive continental breakfast that is included in the stay. In the afternoon, there is a complimentary tea and wine hour. This riverside home in Newburyport was built in 1845 and maintains its charm while benefitting from modern amenities. There are two guest rooms to choose from, each with its own décor, including hand-woven African textiles and European art. 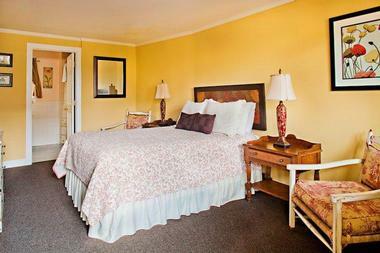 Both have wireless internet access and queen beds, and one also has a gorgeous view of the river. The shared guest bathroom has artistic appointments like a hand-painted Mexican sink. Guests can relax in the living room or breakfast room. It is just a short walk away from the historic downtown and has excellent river access. The inn has its own beach chairs and makes it easy to rent a bike or reach the kayak or boat launch. As a bed and breakfast, every stay includes a complimentary breakfast with hot beverages, fruit, a main dish, and more in the breakfast room. The inn opens for the season in mid-May. This colonial home dates back to 1734 and is surrounded by scenic views in Stow. There are three bedrooms and one suite to choose from, and every guestroom has its own private bathroom. The rooms all feature queen or king beds, original artwork, and antique furniture along with hand-ironed 700-count Egyptian cotton bed linens, pillows, and duvets filled with goose down, fluffy oversized towels, and toiletries from Gilchrist & Soames. The rooms also have flat screen HD TVs with DVD players and more than 100 HD channels, K-cup coffee machines, and free wireless internet. Guests can explore the almost three acres of woodlands and gardens on the property or sit in the spacious living room, screened porch, sunroom, or dining room. The day begins with a full country breakfast, which includes a fresh hot entrée and cold buffet. The Guests’ Sitting Room always has complimentary fruit, snacks, baked goods, and drinks including wine, beer, and hot beverages. 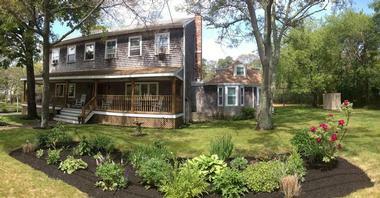 This bed and breakfast is located in historic Bass River Village in South Yarmouth in the middle of Cape Cod, perfect for relaxation and easy access to local attractions. It was built around 1849 and has been beautifully restored and is even part of the National Register of Historic Places. Every room and suite is individually decorated and has a large private bathroom, typically with a Jacuzzi. Rooms also have individual heat controls, air conditioners, irons and ironing boards, hair dryers, bathrobes, TVs, fresh flowers, fine sweet treats, luxurious linens, fine bath amenities, and fluffy towels. Some also have outdoor sitting areas, private entrances, and fireplaces. Guests can enjoy the gardens, sit on the wrap around porch, or relax in the elegant parlor. There is access to an in-house video library, and guests can enjoy complimentary soft drinks and popcorn. You can also borrow a beach towel and beach chair. The seasonal breakfast is served at private tables in the enclosed courtyard or formal dining room and includes fresh hot entrees, juice, and more. The evening includes fine tea and fresh-baked cookies, and in the evening, you can enjoy complimentary port wine or sherry. 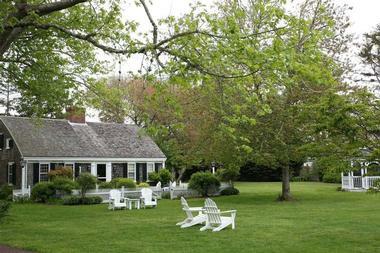 Designed for romance, the Palmer House Inn is a popular couple’s getaway in Cape Cod. It is located in a New English Village within a residential area with elegant homes, colorful gardens, and picket fences. There are 16 rooms and a cottage for guests to stay in, including those with king or queen beds, both, double beds, and Jacuzzi-style tubs and/or fireplaces. One of the rooms is also ADA handicapped accessible. Every room has 600 thread count triple sheets, alarm clock radios, telephones, irons with ironing boards, hair dryers, luggage racks, ice buckets, ceiling fans, air conditioning, and bottled water. Throughout the entire property, you will notice stained glass windows, hardwood floors, antique furnishings, and rich woodwork. Complimentary wireless internet is available everywhere except the cottage. Guests can relax in the front porch, walk through the garden, or sit in the living room. There are also bicycles available. The complimentary gourmet breakfast is served in the breakfast room filled with sunlight, and it varies day to day. It can feature things like an Atlantic salmon quiche, bagel and cream cheese, and gingerbread pancakes. You can almost always find coffee, tea, ice water, homemade cookies, and candies in the parlor. 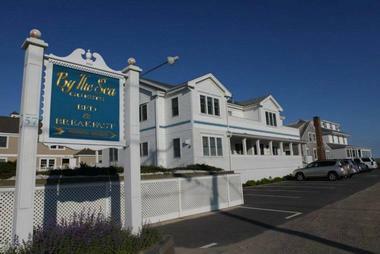 This bed and breakfast is perfect for romance and is close to the National Seashore. The inn itself has a 170-year-old history and a reputation for hospitality. Every room has a flat screen TV, Turkish robes and towels, irons, Zents aromatherapy products, Sol Reya head raps, and luxurious linens from Matouk and Malouf. Some rooms also have steam showers and fireplaces. Guests will enjoy exploring the grounds and outdoor gardens, including the tree swing. There is also a Game Library for guests to borrow from and chocolates during high season turn down service. Every stay includes a full breakfast in the Garden Room with its sunlight. You can also view the breakfast gallery area or go into the patio area while eating. Breakfast includes locally roasted coffee, specialty tea, fresh muffins and cobblers, Chatham jellies and jams, Vermont bacon or sausage, an omelet, French toast, and fruit pancakes. You will find hot cocoa and coffee in the Garden Gallery all day long. The inn also works with local spas and salons to help guests make appointments. Brook Farm Inn is a luxurious bed and breakfast that is incredibly close to the center area of Lenox in the Berkshires. The inn prides itself on creating a cozy atmosphere, and guests can stay in one of the fifteen premium guest rooms. There are accommodations for two as well as larger suites perfect for families or groups of friends. Some rooms have private fireplaces and all have gorgeous views and homey décor. Guests can schedule a massage, acupressure, reflexology, or similar service from one of the ten licensed therapists on our staff. The inn even has a charging station for electric vehicles. The Guest Pantry has two fridges, a Keurig machine, an ice machine, and a cookie jar. The buffet style breakfast is served every morning in the dining room with home baked breads and muffins, fresh coffee, and other treats. The main dish may be something such as scrambled eggs with salmon, cinnamon baked French toast, Dijon and White Cheddar baked eggs, or specialty pancakes. There is always Greek yogurt, granola, oatmeal, and fresh fruit. There is afternoon tea on Fridays and Saturdays with scones and tea. 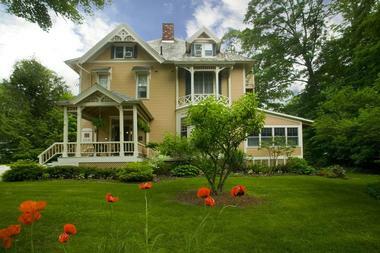 The Gryphon House is a relaxing Back Bay bed and breakfast in Boston. 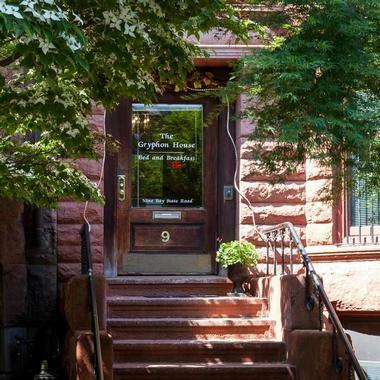 It is in a brownstone from the turn of the century and is within a quick walk of all of Boston’s attractions. Each of the eight suites has queen sized beds, air conditioning, gas log fireplaces, HD TVs with HBO and HD Direct-TV, a DVD player, a tape and CD player, a spacious private bath, a wet bar with a fridge, phone and voicemail, and high speed internet via wired or wireless connections. Most of the private bathrooms have both a tub and a shower so you can soak and relax. Rooms also have hair dryers, irons, robes, coffee makers, teakettles, and toasters. This bed and breakfast has on-site parking so guests have one less thing to worry about, and they can borrow from an extensive DVD library for a relaxing night in. Guests are treated to an extended continental breakfast in the morning. This romantic Cape Cod bed and breakfast is just ten minutes away from Nantucket Sound on foot, and it is within easy access of all the local attractions. Each of the six guest rooms has bathrobes to relax in along with a cable TV and DVD player, alarm clock radio, toiletries from Gilchrist & Soames, a hair dryer, an iron plus ironing board, air conditioning, luxury bed linens, ice buckets, and glasses. There is also nightly turndown service with fine chocolates. The entire property has wireless internet, and there are two guest refrigerators. You can borrow beach chairs and towels or enjoy the baby grand piano, gas fireplace, or open and screened in porches. The day starts with a complimentary multi-course breakfast on the screened porch or dining room. The menu varies but may include a range of scones, omelets, French toast with fruit, quiches, Belgian waffles, apple pancakes, frittatas, and more in addition to home-baked goods and fresh fruit. There is also 24-hour access to Keurig beverages and an icemaker. This inn transports you back in time with its centuries-old construction and its location in historic Lenox. It is a short walk from boutiques, restaurants, and more. The bed and breakfast has three different buildings with twenty-eight guest rooms. Some can be combined to create suites while others have lofts. The MacDonald House is from 1777 and has ten guestrooms and charming functional fireplaces. The Main House dates from 1888 and has ten guest rooms with the common sitting areas, wireless internet, and a communal computer. The Carriage House is where you will find loft units with kitchens. Guests can explore the four acres of land that include groomed gardens with a pond and mountainous waterfalls in the backdrop. The buildings have complimentary wireless internet. Breakfast is served on the deck or in the breakfast room with its glass surround. In addition to tea, coffee, juice, homemade muffins, cereals, and organic yogurt, breakfast comes with home fries, sausage, French toast, pancakes, and egg frittatas. This boutique bed and breakfast combines graceful architecture and traditional charm with modern comforts. The guest rooms and the suites are versatile enough for families or romantic getaways. There are six guest rooms, each with its own amenities such as king or queen-sized four-poster beds, vaulted ceilings, full length mirrors, electric fireplaces, air conditioning, wireless internet, two-person whirlpool tubs, cable TV, seating areas, filled bookcases, and large windows with gorgeous views. There are common areas for relaxation inside and outside. All room rates include breakfast with the choice of one of three seating times. The food is fresh, and the main dish is paired with fresh fruit, tea, organic fair trade coffee, fresh juice, fresh-baked pastries, yogurt, cereal, jams, breads, scones, and more. With notice, the inn can accommodate dietary restrictions. As the name implies, this inn gives guests easy access to all that Martha’s Vineyard has to offer, including coastal attractions. The resort has been hosting guests for more than 20 years, and every bedroom is completely carpeted and has a private bathroom. Other in-room amenities include cable TV, a refrigerated beverage center, irons, ironing boards, hair dryers, air conditioning, free wireless internet, and a private telephone complete with answering service. Some rooms also have kitchens and king-sized beds, and there are two-room suites available. This inn is perfect for a getaway or a celebration like a wedding with its gorgeous waterfront views overlooking a rocky bluff on the Atlantic Ocean. The 1929 art deco mansion has eight guest rooms, and the 1840 Bulfinch House next door has seven more. Suites can have one or two rooms with features like an enclosed sun porch, daybed, trundle bed, and private deck. Other rooms have things like 28 or 40-inch flat screen TVs, decorative fireplaces, and/or full baths with jetted tubs. All have air conditioning, hairdryers, irons with ironing boards, and wireless internet along with private baths. Guests can plan an event in the function room or just enjoy the ocean views from the outdoor patio or oceanfront gazebo. The grounds are manicured and include flowered gardens, and there is even a saltwater pool for guests to swim in. 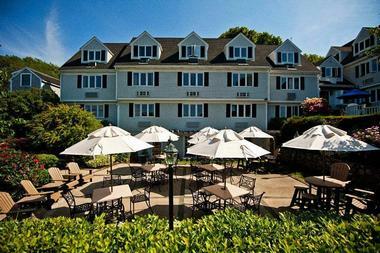 The Madison Inn is a seaside hotel in Oak Bluffs, which is part of Martha’s Vineyard Island. Here, guests are just steps from Nantucket Sound’s gorgeous waters and the harbor along with all the nearby historic sites. Guests can choose from fifteen rooms to stay in, each of which has its own private bath. Every room also has free wireless internet, air conditioning and heating, hair dryers, Gilchrist and Soames toiletries, white noise machines, iHome audio docks, and flat-screen TVs. The inn offers irons with ironing boards upon request, and you can borrow chairs, umbrellas, towels, and toys for the beach along with portable coolers. If you stay on the property, read in the bricked courtyard. Upon arrival, guests receive complimentary bottled water along with snacks. There is always fresh fruit and some granola bars at the coffee bar in the lobby. Guests also have access to a refrigerator and microwave along with a freezer packed with complimentary ice cream bars and ice pops. In the afternoon, cookies are served, and you can enjoy fresh bread from the Morning Glory Farm. This historic inn in Cape Cod is just a few minutes away from main attractions since it is right in the historic district. The building was built in 1699 but has had many additions to expand and modernize it. There are two traditional rooms and four luxury suites for guests. Each room has a full private bath, a separate Jacuzzi tub for two, and a wood-burning fireplace for romance and warmth along with wireless internet. There are also comfortable in-room seating areas, in-room tea and coffee service, bedside chocolates, air conditioning, complimentary spring water, hair dryers, cable TVs, DVD players, and fine toiletries. In addition to comfortable rooms, Ashley Manor also has two acres of grounds that are park-like in nature and feature tennis courts, a gazebo, and a large backyard patio. There is even everything you need for pickle ball on a designated court. Guests receive complimentary parking and have access to the inn’s library. A full gourmet breakfast is served on the patio or in the formal dining room in front of a roaring fire depending on the time of year. You can also arrange for a continental breakfast if you prefer. In the evening, the inn offers complimentary cordials right in the library. The Old Harbor Inn was built in 1932 and has been renovated since then, though it has been providing outstanding hospitality for decades. It is perfect for a coastal escape or romantic getaway with its non-smoking rooms and tour desk, along with the choice of twelve rooms. Every room has designer linens, Gilchrist and Soames luxury bath amenities, bottled water, baskets of welcome snacks, irons, ironing boards, complimentary soft drinks, bathrobes, air conditioning, alarm clock radios with CD players, and TVs with DVD players. The inn has beach umbrellas, chairs, and towels for guests to borrow so you have one less thing to pack. You can relax in the living room or another common area, including the outdoor garden area. The inn also has a fitness center and a hot tub. Your complimentary breakfast begins with a buffet that has coffee, tea, yogurt, cereal, granola, fresh fruit, breads, and bagels. After this, you will get to enjoy a fresh baked item and a hot entrée prepared that morning. Some possible entrees include French toast, omelets, quiche, and pancakes. They can easily accommodate diets without dairy or gluten. During the day, you have access to fresh-brewed coffee, tea, and baked goods, and they are even left out at night. Perfect for romance and relaxation, the Whalewalk Inn and Spa is at the end of a country road for privacy, but it is close enough to local attractions for easy access. The building dates back to 1830 and has been redone to provide modern amenities. The sixteen guest rooms are found across six buildings, and each has private baths. They also feature TVs with a DVD player, air conditioning, irons with ironing boards, hair dryers, and wireless internet. Some rooms also have bathtubs, balconies, fireplaces, kitchenettes, wet bars, in-room tea and coffee, whirlpool tubs, and fridges. Guests have access to the brick patio and sun porch if they want to enjoy the outdoors. The spa is perfect for massages, workouts, and relieving tension, and it is easy to book an appointment. Guests can explore the three and a half acres of land or play some Wii in the spa. Wake up and enjoy breakfast of fresh-brewed coffee, a delicious pastry, sizzling bacon, and a fresh hot entrée. 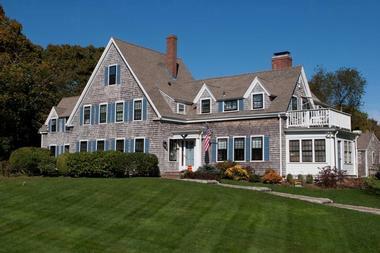 This bed and breakfast has gorgeous views and easy access to the beaches of Cape Cod so you can wake up to enjoy the sunrise and the sound of the waves. The rooms have private bathrooms with imported ceramic tile, paddle fans, air conditioning, Direct HD TV, HBO, wireless internet, sheer white curtains, and a comfortable environment. Most rooms have queen beds, although some have two queen beds, a king bed, or a queen and a twin or trundle. Suites add a living room, gas fireplace, dining room, dishwasher, kitchen with granite countertops, phone, and individual balconies. By The Sea actually has its own private beach so you don’t have to struggle to find a spot to relax. Inside the building, you can enjoy a Victorian fireplace or large TV with surround sound in the living room. There is an area with books, games, magazines, and a piano. The included full breakfast is served on the veranda with its screen and glass enclosures. Enjoy fresh fruit, fresh baked rolls, specialty tea, coffee, juice, a hearty breakfast, and pastries. You will always find homemade cakes and cookies, fresh fruit, and both cold and hot beverages.